Myron T. Steele is a partner in the firm's Corporate Group. He is the former Chief Justice of the Supreme Court of Delaware. 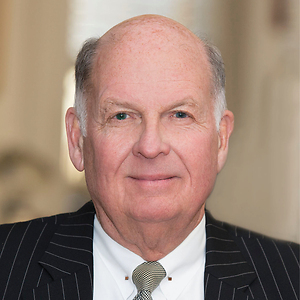 Previously, he served as a Judge of the Superior Court and a Vice Chancellor of the Delaware Court of Chancery after eighteen years in private litigation practice. He has presided over major corporate litigation and LLC and limited partner governance disputes, and writes frequently on issues of corporate document interpretation and corporate governance. Chief Justice Steele has published over 400 opinions resolving disputes among members of limited liability companies, and limited partnerships, and between shareholders and management of both publicly traded and close corporations. He speaks and writes frequently on issues of corporate document interpretation and corporate governance. His thesis for the LL.M. degree, Judicial Scrutiny of Fiduciary Duties in Delaware Limited Partnerships and Limited Liability Companies, focused on the application of common law fiduciary duties within the contractual framework of alternative business organizations. It was published in the Delaware Journal of Corporate Law (32 Del. J. Corp. L. 1 (2007)). The November 2005 issue of The Business Lawyer included an article he co-authored with Sean J. Griffith entitled On Corporate Law Federalism: Threatening the Thaumatrope (61 Bus. Law. 1 (2005)). He co-authored an article with J.W. Verret entitled Delaware’s Guidance: Ensuring Equity for the Modern Witenagemot published in the Fall 2007 issue of the Virginia Law & Business Review (2 Va. L. & Bus. Rev. 188 (2007)). That article formed the basis for a keynote speech to the Business Law Section at the 2007 ABA Annual Meeting. For the last ten years he served as judicial advisor to the Mergers and Acquisitions Committee of the ABA Business Law Section. He also co-authored an article entitled “Freedom of Contract and Default Contractual Duties in Delaware Limited Partnerships and Limited Liability Companies” (46 Am. Bus. L.J. 221 (Summer 2009)) and an essay entitled “The Moral Underpinning of Delaware’s Modern Corporate Fiduciary Duties” (26 Notre Dame J.L. Ethics & Pub. Pol’y 3 (2012)). Chief Justice Steele served as Adjunct Professor of Law at University of Pennsylvania Law School from 2009–2013; University of Virginia Law School 2010–2017; and Pepperdine University Law School 2010–2014. Appointment of Independent Directors on the Eve of Bankruptcy: Why the Growing Trend? Myron T. Steele to Moderate Panel: What is the Future of the Board-Centric Model? Myron T. Steele to Present on Panel: Eat, Pray, Represent Me: Are You My Client and Do I Owe You a Duty?